The solution is simple for QuickTextPaste , if does not save the settings, or if you want to uninstall it! 1.) ... If QuickTextPaste don't save the settings! 2.) ... Uninstall QuickTextPaste from Windows! 3.) ... How can I load old version Quick Text to newest version program? 1.) If QuickTextPaste don't save the settings! Don't use the TEMP folder in Windows and don't start the QuickTextPaste.exe from the zip folder. See also: ... what does restore the clipboard? (Image-1) QuickTextPaste in the QuickTextPaste Folder on C Drive! 2.) Uninstall QuickTextPaste from Windows! Please Read This: Open the program path via Windows-10 Task-Manager! 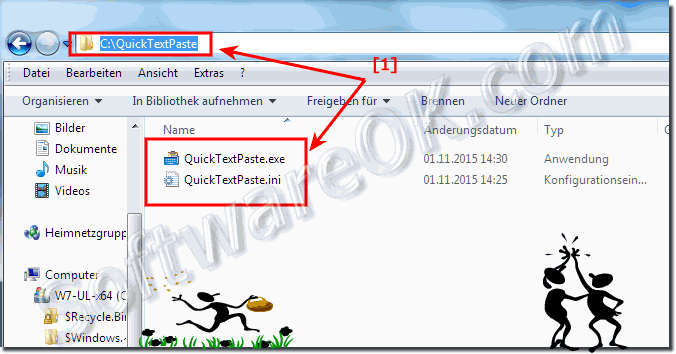 (Image-2) Uninstall QuickTextPaste from Windows! 3.) How can I load old version Quick Text to newest version program? Please Download Quick-Text-Paste and replace the QuickTextPaste.exe with the new version. Please use ► ... always the latest version of QuickTextPaste ! QuickTextPaste - FAQ-13: QuickTextPaste does not save the settings, how can I uninstall it?